Have you had a terrible vacation experience? Would you like to sell a holiday from hell story to magazines and newspapers? If you would like to sell a story, we want to hear from you. Talk to the Press provide a free, no obligation service to help you make the most from your story. We’re here to make sure you’re not misrepresented and YOUR STORY is told YOUR WAY. Simply fill in the form on this page with a little info about your story. We’ll get back to you with a valuation for your story. One of our friendly writers will talk you through the next steps. Reporter Isolde Walters telephoned him and heard about his holiday from hell. Adam explained that he had been on a family holiday to Mexico when he decided to take his three teenage sons on a family expedition into the jungle. It was a trip arranged through his hotel and he was assured it was perfectly safe. Adam and his boys climbed into a buggy to drive through the jungle but just ten minutes later the vehicle flipped over. 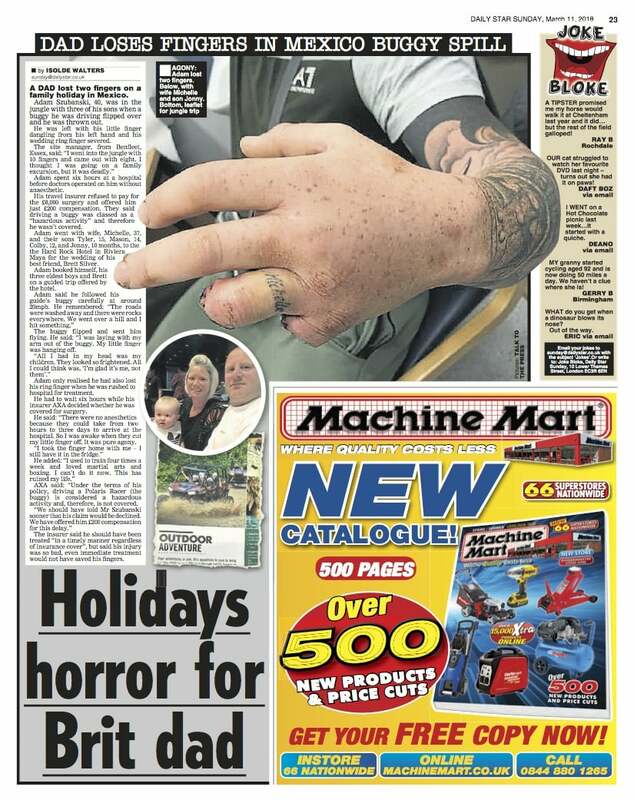 Thankfully Adam’s sons were safe but he was thrown from the buggy and lost two fingers in the crash. Isolde was horrified by what Adam had been through especially when he told her that his insurer had refused to pay out because they claimed the vehicle was not covered by his policy. She got down all the details, wrote a memo and asked Adam to send pictures and emails from his insurer as proof to back up his story. She sent the story to our contact at The Star On Sunday who was just as moved as she was by Adam’s experience. We negotiated a substantial fee for Adam and his story was published as a page lead in the Sunday paper. With Adam’s agreement, Isolde then sent his story to our news wire where it was picked up by the Daily Mail and even America’s Fox News. Isolde ensured that Adam was paid each time his story was published. After selling a story to the Daily Mail and The Star on Sunday, the next week Isolde arranged a magazine deal for Adam’s wife Michelle to tell the story from her perspective. Isolde secured a substantial fee from Real People magazine for Michelle. Although nothing could bring back Adam’s fingers, he was happy with the coverage that Talk to the Press had secured in the national press. The story raised much-needed money and also awareness. Other holiday goers would be aware of the pitfalls of travel insurance. Have you got a story you’d like to sell? Have you got a story that should be in the press? Do you have close knowledge of a newsworthy event that you would like to get out there? If so, get in touch by filling out a story form or calling 0207 549 5419. Whether you’d like to sell a holiday from hell story, or any other type of story, we want to hear from you. We work in your interests, to get you the best fee possible for your content. Furthermore, we make the process as smooth as possible. If you are unsure and want some free advice, just give us a call. Our service won’t cost you a penny. Furthermore, there is no obligation, and we will never publish anything you send us without your prior consent. For more information about how our service works, you can read the Sell My Story – How it Works page. Finally, for other ways to contact our journalists, see the Contact Us page.